The people behind Bid Ocean and the North America Procurement Council (NAPC) are launching another magazine. 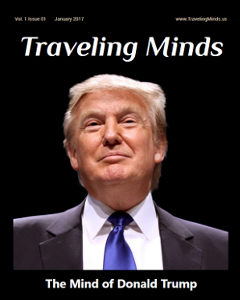 Traveling Minds magazine will be a monthly PDF, epub and audio publication for thinkers, with daily web articles and essays on some of the most important issues facing humanity. The new magazine will supplement the NAPC's magazine, Trillions, with non-business related content. Trillions will continue to focus primarily on business topics and avoid the more sensitive issues that have rankled some readers. With most people overwhelmed with information from a growing number of sources, the last thing most people want is yet another source of information. However, mainstream and alternative media often present distorted or incomplete information. Some of the most important information that we need to make sound choices and understand the world around us is seriously lacking. Traveling Minds will not pursue a hidden agenda and will present multiple perspectives on important topics. Its agenda is the pursuit of truth and understanding. We will endeavor to publish information that is important, relevant and useful. We aim to cut through the crap that permeates most other media and dismantle obsolete and false belief systems. Traveling Minds won't be left wing nor right wing. Both wings are needed to fly straight and not go in circles. Cover of the January issue of Traveling Minds magazine, to be out on January 2nd, 2017. Our first issue will feature an honest and straightforward article on Donald Trump along with an open letter to the future President of the United States. Bid Ocean and its subsidiary, NAPC, are staffed with 180 intelligent and compassionate people in 8 countries. We process vast amounts of information every day, do advanced research in different fields, think a lot about the future and are creating a new and more sustainable human culture. Humanity faces a very challenging future and we need to be having meaningful discussions about how we got to this point and how can survive the future. We hope that you will join us and contribute your own articles, essays and feedback.